I love Christmas Break, as I get to do nothing but read (and write about what I read) for three straight weeks. As much as I love short stories, short story collections are always hit or miss. You may find one or a few good stories amongst the pack, or several decent offerings. Very rarely are ALL of the stories in a collection each a strong, workable a piece of art. This book of stories is one of the few exceptions. 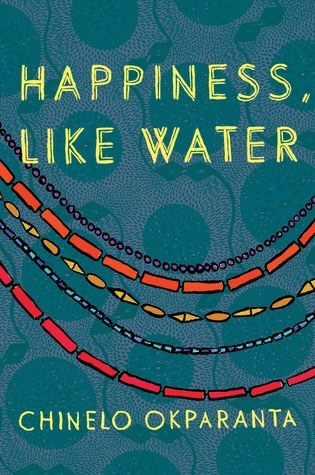 “Happiness, Like Water” has 10 short stories, mostly featuring Nigerian woman who are dealing with contemporary issues such as unhealthy relationships, homosexuality, societal pressures, and what it means to be modern African woman in Africa, or, in some cases, America. Each of these stories are unapologetically feminist, with each character in each story making some kind of choice for her own future and taking her own destiny into her hands. In some cases, the choice has disastrous consequences, but in others, the characters find some kind of lasting peace. The powerful story “Runs Girl” was my favorite in this collection, which tells the story of a young woman’s choice to dabble in prostitution to find the money to cure her mother’s illness. “Wahala!” is the tale of a woman who visits a traditional healer to cure her infertility and is forced to endure painful sexual encounters with her husband in order to have a child to conform to society’s expectations. “Fairness” is about one girl’s quest to be beautiful through the use of a skin bleaching technique that has dangerous consequences. “Story! Story!” is a suspenseful tale of a young woman’s obsession, with a shocking conclusion. Several of these stories seemed to be companion pieces, ‘twins,’ if you will–two halves of the same event. In “America,” a young teacher tries to get a visa to join her lover in the U.S. In “Grace,” the focus is a romance between an older, divorced African American professor and a young Nigerian woman who is expected to be married. “Shelter” is the story of a young immigrant mother and daughter’s quest to leave an abusive marriage, and “Tumours and Butterflies” picks up that same story 20 years later, with a daughter’s choice to abandon her familial obligations in the face of her father’s cruelty and her mother’s complicity with their abusive past. The weakest story here was the only with a male protagonist. As far as characters go, there is not much variety. There is a lot of sameness that gets somewhat repetitive–nearly all except the one mentioned above was about young women, usually serving in the education profession as a teacher. Overall, this is a strong collection. It is hard to believe that this is Okparanta’s first book, as she is definitely an author to watch. Her writing is good and descriptions of events are solid. She does have a full length novel that came out several months ago that I will read, and I’m excited to find yet another talented contemporary Nigerian writer (Chimamanda Ngozi Adichie, A. Igoni Barrett, Sefi Atta are others) that people NEED to be reading right now.